Our Maple Lane series is inspired by the classic, clean lines of Scandinavian Design. 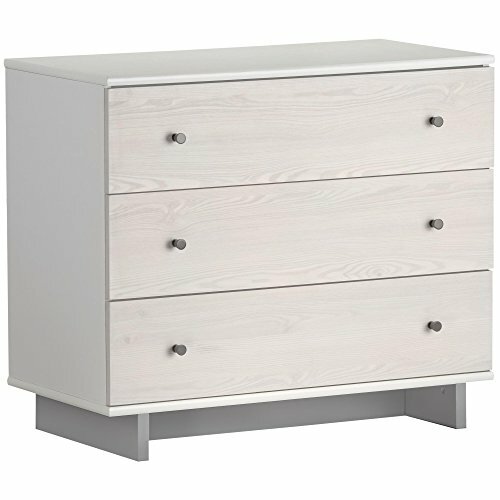 The three drawer dresser comes with delicate Enchanted Pine whitewashed drawer fronts made with laminates imported from Europe. These drawer fronts are white with a light brown woodgrain print. The cabinet is white. The Maple Lane dresser converts to a changing table by adding our optional changing station top, (sold separately). Like all Little Seeds products, this purchase helps support a major environmental initiative. Discover how this can help you and your child involve your community in habitat rebuilding. The Monarch Hill Changing Table Topper (6819015COM) coordinates with this 3-Drawer Dresser for an added changing table surface. Stability tested to meet or exceed tip standards. Anti-tip kit included for extra protection. Changing table topper (sold separately) can be added to create a changing table by attaching to the back of the dresser. View More In Armoires & Dressers.